Check Your Lumps & Bumps at the Library! Have you checked for Lumps & Bumps lately? 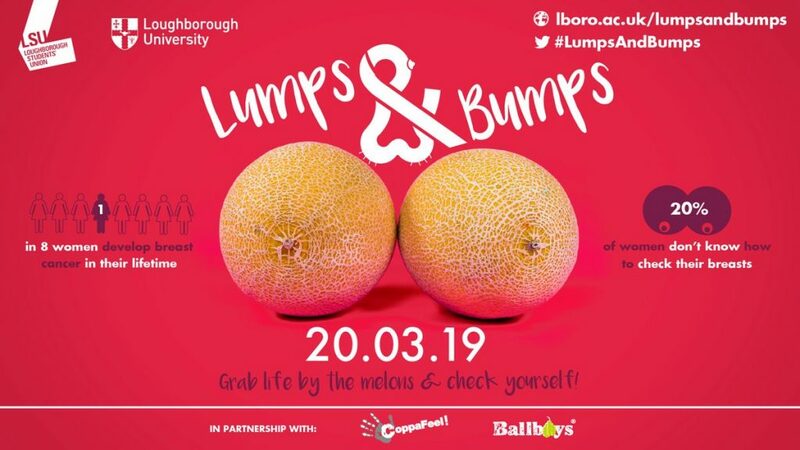 All across campus tomorrow the University will be hosting Lumps and Bumps, a 12-hour collaborative event hosted by Loughborough University and Loughborough Students’ Union which aims to equip attendees with the knowledge and confidence required to check themselves. Each session will showcase a range of techniques that can be used to detect these life-threatening diseases, as well as raising the profile of the vital work carried out by our charity partners – CoppaFeel! and Ballboys. The event is open to all regardless of any prior training that you may have received. We strongly believe that refreshing your memory of what to look out for is just as important as learning the techniques and signs in the first place. There is no restriction on who can attend the sessions and we welcome attendees to learn how to check both breasts and testicles if they wish to. The sessions themselves are simple and take around 30 minutes. The format will be a mixture of presentation-led content with an opportunity to then practice technique on specialist training mannequins. The Library will also be hosting sessions on the hour in Seminar Room 1. Next week the Martin Hall is hosting an evening of poetry readings, book signings and Q+A with two young poets with brilliant debut publications. 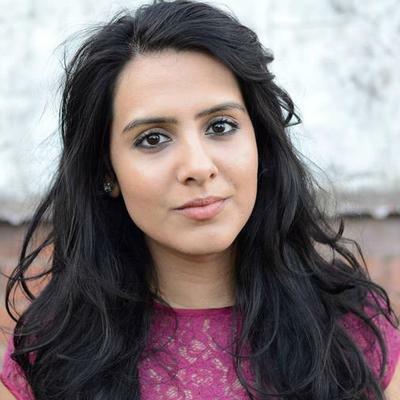 Shruti Chauhan (pictured) is a Loughborough English graduate of and has previously performed at the University as part of the Three the Hard Way national tour with Jean Binta Breeze and Lydia Towsey. She won the prize for Best Spoken Word Performer at the Saboteur Awards 2018, as well as the National Poetry Library’s Instapoetry competition in the same year. Her debut collection is from Burning Eye Books, which has a reputation for publishing work by the best spoken word poets. She read from the publication at 2018’s Verve Poetry Festival, and is a workshop leader and writing mentor. The event takes place next Tuesday, 19th March, from 6pm-7.30pm in the Stanley Evernden Studio in Martin Hall. Admission is free, but space is limited. To book a place email Kerry Featherstone. With exams looming on the horizon, the Easter holidays are a good time to take breath and take stock before the Summer Term starts. It’s also a good opportunity to catch up with your reading – so why not stock up for the holidays safe in the knowledge that you won’t have to return or renew them until the start of term. Undergraduate Long Loan and Week Loan books will be due for return on the 1st May. Undergraduate Finalist & Postgraduate Long Loan and Week Loan books will be due for return on the 3rd May. Staff and Researcher Week Loan books will be issued until the 3rd May. External & Alumni loans will continue on a 4-week rolling basis. You’ll be pleased to hear that we do not recall books over the Easter Vacation. The last Recall notices will be sent out on Monday 18th March and recalls will restart on 29th April. However, please be aware that any books issued from the Hold shelf that still have outstanding requests on them, will still only issue for One Week, so take care to check your receipt when borrowing. 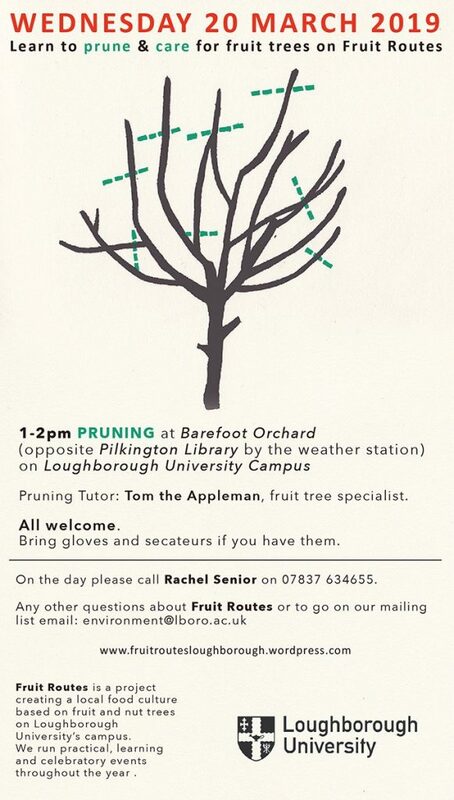 An innovative pop-up art exhibition by Loughborough students begins tomorrow in the Shirley Pearce Square tomorrow (Thursday 14th March). Landed features work by second year Fine Arts students installed inside shipping containers – hence the name! The exhibition begins at 2pm tomorrow and will remain landed until Wednesday 27th March. It will open to visitors 11am – 3pm Monday to Saturday (except on Thursdays, which will be 12pm – 3pm), but closed on Sundays. Admission is free. Finding the right sources of information for any subject can be tricky, given the vast amount of resources there are available to you via our vast range on online resources. This is especially true of the Science, Technology, Engineering and Medicine (or STEM) disciplines. With that in mind, our Academic Librarians have created a set of online guides tailored to these subject areas. Each link gives you a concise run-down of everything you need to know about finding information for your subject, including the contact details for the Academic Librarian responsible for the School/Department concerned. Be sure to visit and bookmark the links for future reference – you’ll certainly find them useful! 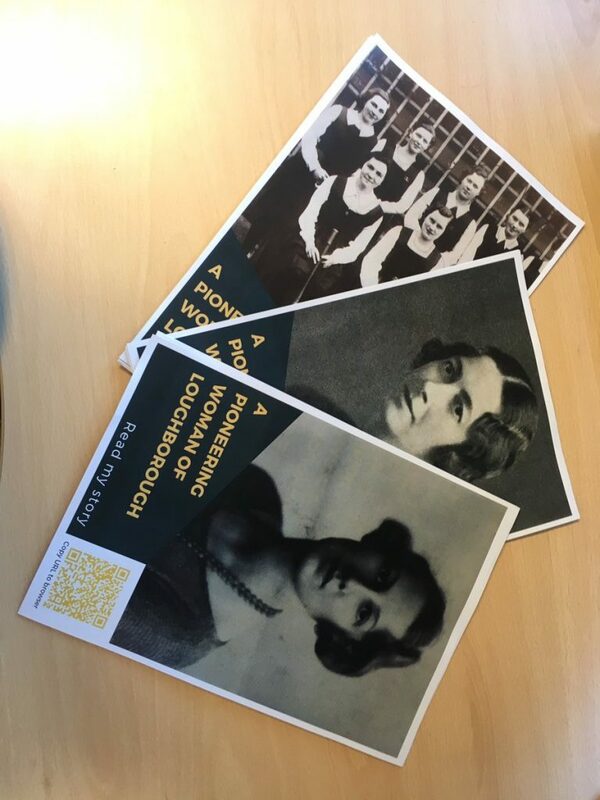 the Women’s Engineering Society at Loughborough University have launched a poster campaign across campus utilising images and information courtesy of our very own archives. A Pioneering Woman of Loughborough showcases the life and work of two remarkable Alumni who both graduated from the then Loughborough Engineering College in 1922 – Verena Holmes and Claudia Parsons. Verena Holmes became the first woman to be elected to the prestigious Institute of Mechanical Engineers in 1924, and was President of the Women’s Engineering Society in 1931. Along with Verena Holmes and Dorothea Travers, Claudia Parsons was one of the first women to be admitted to the Loughborough Engineering College, and went on to become the first woman as well to circumnavigate the world in 1938. Maggie Aderin Pocock, Kate Bellingham, Helen Czers and Jessica Wade, who delivered last year’s lecture. The University further honoured Claudia by naming its newest Hall of Residence (to be opened this September) after her. The photographs and accompanying information detailed for the campaign were provided by the University Archivist Jenny Clark, who is based here in the Library. Would you know what to say to a friend or colleague if you suspected they were struggling with their mental health, and possibly having thoughts about suicide? 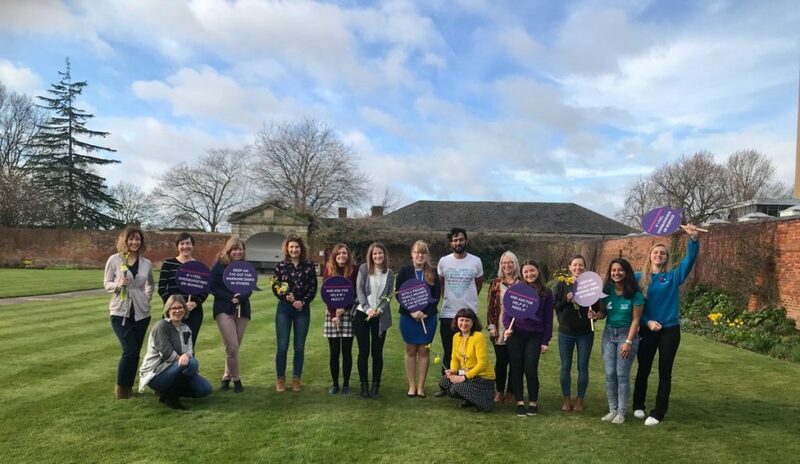 Today (Thursday 7th March) is University Mental Health Day, and Loughborough University is using its voice to ‘start a conversation’. During transitions and periods of emotional distress, such as leaving home for the first time and arriving at university, some students can feel alone, isolated and at times have thoughts about death. 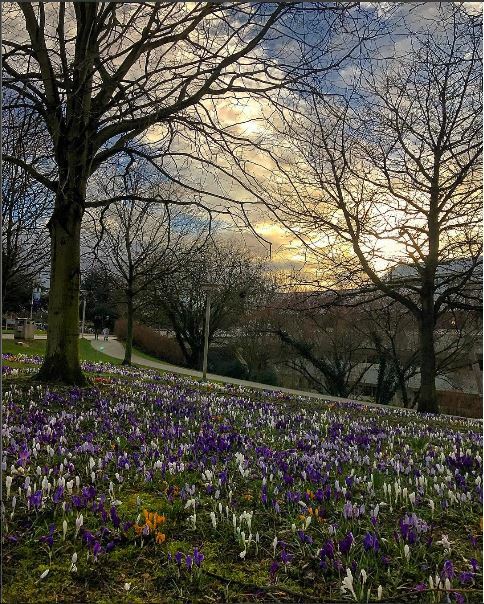 There are many support services available at Loughborough University and sometimes a friend, academic or warden will see signs that a student is having difficulties. However, there are also things which staff and students can do to make people feel less alone and more confident to share difficult feelings. This year the University is asking the Loughborough Family to pledge to start a conversation. The University’s Mental Health Team will be out and about on campus today with plaques featuring each of the messages above. They are asking students to consider making one of these pledges, and if they feel confident enough, to share photos of themselves with the plaques on social media, using the hashtags #startaconversation and #lborofamily. Things to look out for – whether it is a friend, supervisee or colleague, know the signs to look out for. These include changes in behaviour, a loss of interest in activities or talking about hopelessness or feeling alone. Show empathy – Empathy is the skill of being with someone and showing that you understand their perspective. For example, as an academic you may have experienced the pressure or anxiety linked to research, so by talking to and showing your understanding to a colleague or student it can really help them. Know where to go next – Having an understanding of both the University and wider community support services that can help students who are experiencing mental ill health or emotional distress is a good place to start. The University has a Medical Centre on site, Wellbeing Advisers within Academic Schools, a Student Advice and Support Service, alongside Mental Health and Counselling Services. The Library also has its own range of Mood-Boosting and ‘Books on Prescription’ self-help works among our Leisure Reading collection upstairs on Level 4. The local community can offer support through the NHS’s Let’s Talk Wellbeing service, as well as Harmless – which supports people bereaved by suicide – and Turning Point, which offers a 24-hour crisis helpline. The Start a Conversation website also offers advice and resources. Should you require urgent help, visit the Leicestershire NHS webpages for contact details. 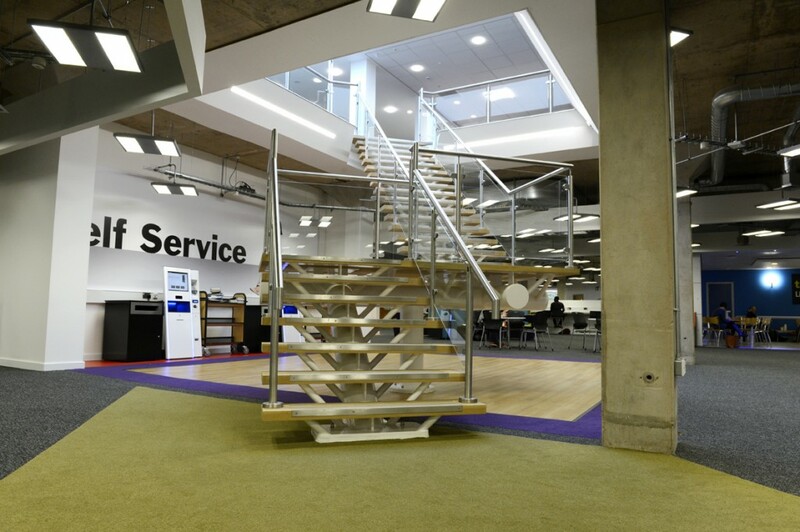 Tomorrow morning (Friday 8th March) contractors will be in the Library to do some data cabling work in the foyer and other areas of Level 3. They are hoping to get the majority of the ceiling work done before the Library opens at 8.30 but other works will continue throughout the morning. The works are to sort out some issues which have arisen with the network. Facilities Management and IT Services have apologised for any inconvenience this may cause. Need to let off a bit of STEAM before the end of term? Look no further! 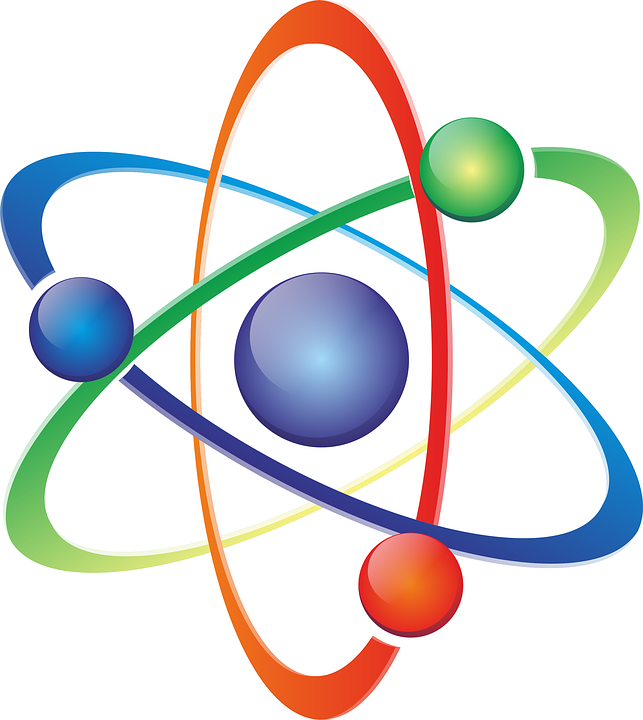 STEAM is a week of inter-disciplinary adventures, involving Science, Technology, Engineering, Arts and Maths. 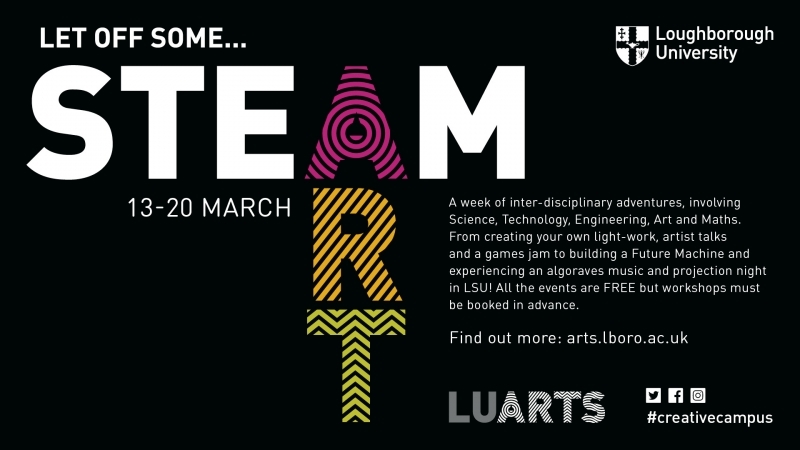 From creating your own light-work, artist talks and a games jam to building a Future Machine and experiencing an Algoraves electronic music and light pojections night in LSU. All these events are FREE but workshops must be booked in advance. For booking information and full timetable of events, visit this link.